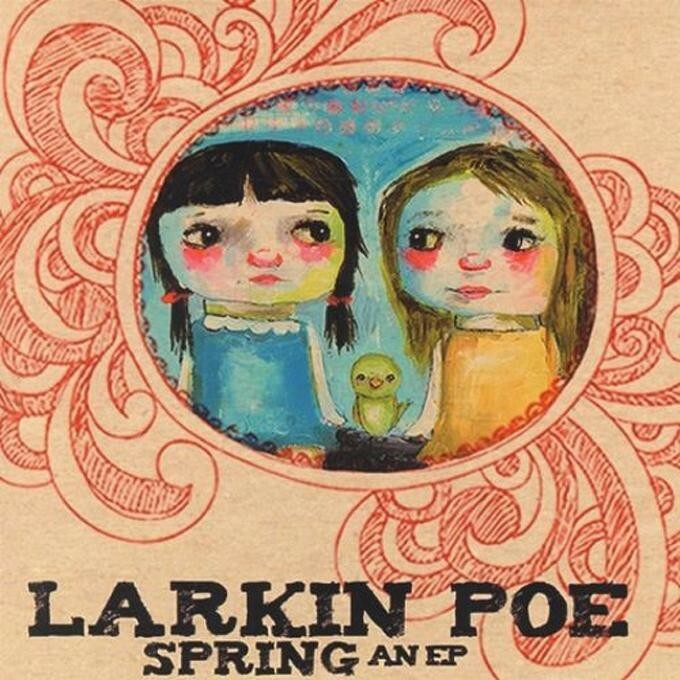 Originally a three-part sisterly act that released a couple of albums as The Lovell Sisters, our trio has now been whittled down to a duo of siblings, Rebecca and Meagan, and renamed Larkin Poe in honour of their great-great-great-grandfather. Elder sis Jessica got hitched and returned to collage, taking a sabbatical away from the music, though it must be pointed out they’re all still quite young. Already they’ve been exceptionally busy learning their chosen craft, classically trained and immersed in the musical influences of country, folk and bluegrass, whilst happily accepting an abundance of superlative acclaim in the process, and working with esteemed colleges like Elvis Costello. Tours of the states, with appearances at The Grand Ole Opry itself and a stint on the Cayamo Cruise, where they found themselves playing alongside luminaries Emmylou Harris and Steve Earle – who are both strongly evoked on this EP. Rebecca even won the prestigious mandolin contest at the Merlefest when only 15, the youngest and first woman to ever do so. There capabilities and skills are not in question, but I’m still ill at ease with all this folklore methodology and earnestness that’s bundled alongside it. Fair enough, they produce diaphanous delicate songs of heartbreak and resigned fate, yet this aping of an old western theme begins to grate. In much the same way as groups like Mumford and Sons, in their rolled up sleeved shirts and Tolpuddle martyrs fashioned posturing, take on an air of nostalgia for a time rewritten to fit in nicely with a halcyon vision of toil and salt of the earth like pretensions. Harsh but overdue all the same! Spring then is made up of the usual themed fare of break-ups, no-good cheating partners and boys who have the devil in them. Both sisters take turns in singing the lead, from pulchritude tones to emotive folk taut sweetness. Backing arrives courtesy of a Knoxville based session trio, who lay down deft restrained backbeats of Americana and country tinged blues, with arching lap steel twangs and countless stereotypical moody strains of hurt sounding guitars. Our atavistic like band open with a count-in before shuffling into a chugging acoustic number of wry floating melodies, with the introductory track ‘Long Hard Fall’, a good criterion with which to gauge the rest of these 9 songs by. Rebecca misses no opportunity in whipping out the mandolin to twinkle away on, playing a melodic sparkly signature over a theme of recalcitrant reaction to her plight. Highlights include the roaming finger picking moody paced drift of ‘Burglary’. Stirring prangs of guilt and indolent building evocative atmospherics play out a tale of a woefully self-centred individual whose been “stealing hearts again”. ‘The Principle Of Silver Lining’ bounces off staccato rim-shots; shakers and lean sparse bending pained notes. Sang with a certain tautness and done me wrong attitude, our lonesome songstress coos about the darkness being a comforter, whilst the backing slowly becomes more menacing and picks-up with an extended instrumental outro. At times the sisters sail rather too closely to the Dixie Chicks – who there often compared to – though our girls have a more inspired sound and never fall wholly into the pit of cliché and outright commercialism like their American counterparts. The girls have stated that they wish to incorporate pop and soul into their sound, which is evident on certain moments throughout this release, but doesn’t make for an original sound. Spring is an EP that will inevitably do the trick in the current call for more homely sounds; with festivals slots and blanket radio play imminent.